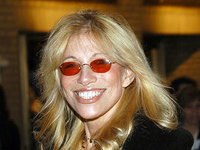 Carly Simon was one of the most popular of the confessional singer/songwriters who emerged in the early ’70s. The youngest child in an upper-class New York family (her father, Richard Simon, co-founded the Simon and Schuster publishing company), Simon got her start in music as part of a duo with her sister Lucy (who later wrote the music for the Broadway show The Secret Garden). The Simon Sisters had a chart single with “Winkin’ Blinkin’ and Nod” in April 1964. But Simon’s solo debut did not come until the release of her self-titled first album in February 1971. It contained her first solo hit, “That’s the Way I’ve Always Heard It Should Be,” an anti-marriage song co-written with Jacob Brackman that reached the Top Ten. Simon’s second album, Anticipation (November 1971) (which went gold in two years), contained a Top 40 follow-up in the title song, and she won the 1971 Grammy Award for Best New Artist. Her third album, the gold number one No Secrets (November 1972), was produced by Richard Perry and contained the gold number one hit “You’re So Vain,” which aroused speculation about its subject. Mick Jagger, one of those suggested, sang backup on the recording. “The Right Thing to Do,” a second single from the album, made the Top 40. In October 1980, Simon collapsed of exhaustion on-stage, after which her concert appearances became rare. Her next album, Torch (September 1981), was given over to pre- and non-rock covers. In 1982, Simon scored a Top Ten U.K. hit with “Why,” a song produced by the disco group Chic from the movie Soup for One. In 1983, she returned to the U.K. Top 40 as the uncredited singer on the Will Powers (Lynn Goldsmith) satire “Kissing with Confidence.” Simon’s career in the U.S. was in decline, however, as the albums Hello Big Man (September 1983) and Spoiled Girl (July 1985) were poor sellers. She returned to the Top 40 in 1986 with another movie theme, “Coming Around Again,” from Heartburn (the 1987 Coming Around Again LP went platinum) and had yet another movie-related hit with the Grammy- and Oscar-winning “Let the River Run” from the film Working Girl in 1988.